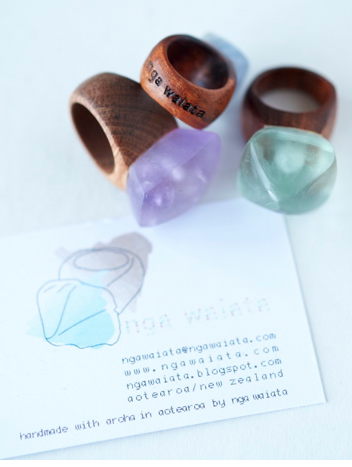 On one of my recent trips I came across jewelry designer Nga Waiata while browsing through the jewelry department at Barney's. 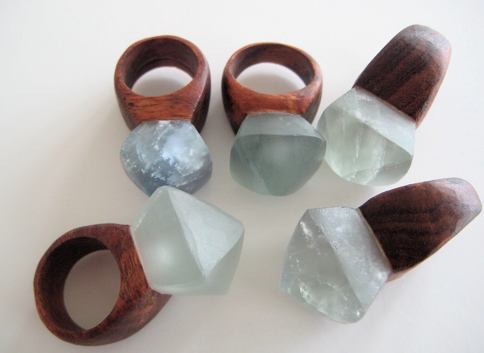 I immediately fell in love with her fabulous chunky rings made of crystals and recycled wood. Not only are they great looking but did you know: crystals are said to have healing properties as well as the ability to transform an imbalanced energy field? When you feel stressed, the crystal can balance your energies and revitalize you. Check out the designers website for more information as to what ring would be perfect for you! said to bring clarity, on every level identifying truth behind illusion...you can tell when someone is lying to you. Very good for centering, calming and balancing. If you are confused this is the crystal for you!